All the major players participating in Saturday’s “UFC on FOX: Shogun vs. Vera” extravaganza will be hitting the podium today inside JW Marriott LA Live. Stream Thursday’s pre-fight press conference live right here on 5thRound.com starting at 2PM ET/11AM PT. 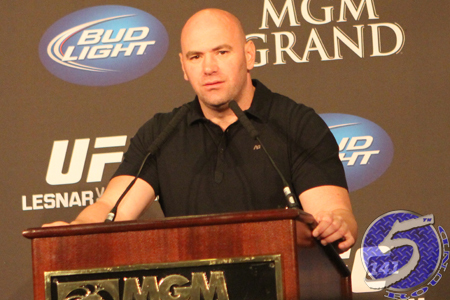 In addition to UFC president Dana White (Pictured), Mauricio “Shogun” Rua, Brandon Vera, Lyoto Machida, Ryan Bader, Joe Lauzon and Jamie Varner will all be at the podium. Shogun and Vera battle in Saturday night’s featured attraction.